The Beocord Belcanto was a highly unusual design. 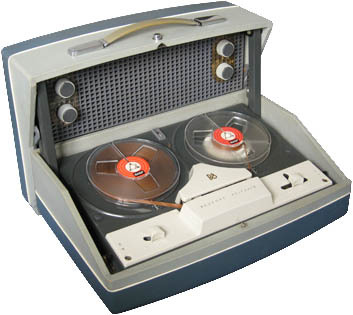 Rather than simply being a portable recorder with a detachable lid, the mechanism and electronics were housed in a two-part cabinet that folded closed on specially designed hinges. The lower part contained the tape deck, the bias oscillator/erase generator, the level indicator and the mains switches where as the upper part contained the power supply, recording/playback amplifier, output stage and loudspeaker. Flexible cables hidden in the hinges interconnected the two units. Text copyright © Beocentral. Unauthorised reproduction prohibited. The tape mechanism itself was also a point of interest. Despite having designed and produced their own tape mechanisms for some time, B&O instead opted to buy in the TD2 deck from Birmingham Sound Reproducers (BSR). The TD2 was a popular choice but it was seen almost exclusively in budget machines, it was of solid construction but was never aimed at the quality market. B&O made only minor modifications to the TD2, fitting German “Bogen” heads and a metal screen around the motor, adding numbered scales to the top plate to show how much tape remained, replacing the tape counter with a “magic eye” level indicator and replacing the “BSR” badge on the head cover with one that said “B&O” was the extent of what was done. Text copyright © Beocentral. Unauthorised reproduction prohibited. In contrast to the simple tape deck, the electronic parts were expansive and complicated. British manufacturers who used the TD2 had evolved a circuit to go with it that employed three valves (plus a selenium rectifier) and gave acceptable results, though there were some limitations. The circuit of the Belcanto was rather more involved and used four valves and four transistors along with two rectifiers. The main extra function that this added was the ability to use the machine as a PA amplifier as well as a tape recorder, to this end the output stage used two ECL86 valves in a “push-pull” circuit and could produce about 6 watts (a healthy figure for the day) into either the large internal loudspeaker or an external one. The powerful amplifier, which included separate controls for treble and bass, was also used for tape playback and could be switched between two modes, one which gave the richest sound quality and another which allowed for maximum volume. The pre-amplifier used transistors throughout and was mounted on a plug-in module. Text copyright © Beocentral. Unauthorised reproduction prohibited. Despite the large number of components used the electronics of the Beocord Belcanto were quite out of date even when it was new. To change from playback to recording required both the deck and the amplifier to be set separately, progressive manufacturers such as Grundig and Philips had made this task a single button operation many years previously. Also, despite having a separate bias oscillator and a comprehensive amplifier, monitoring during recording was not possible in any meaningful manner as the same volume control was used for both recording and playback and the recording head was driven by the output stage. This meant that although the sound could be heard through the loudspeaker during recording its volume could not be altered without changing what was going onto the tape. Fixed resistors where switched in, in an attempt to make the volume acceptable, but this was in truth a crude measure for such a complex design. The line output connection to a radio or a second recorder was also badly designed and again was subject to the setting of the volume control and invariably accompanied by the sound of the internal loudspeaker. Text copyright © Beocentral. Unauthorised reproduction prohibited. The Beocord Belcanto was the last Beocord design to use valves; its place in the range was later taken over by the Beocord 1100, which was fully transistorised. Text copyright © Beocentral. Unauthorised reproduction prohibited.